Crimestoppers is an independent charity that gives people the power to speak up against crime. We had already partnered with them on a successful ‘Most Wanted’ campaign. Now they approached us with a new challenge: 4.9m UK adults are illegally accessing content through ‘fully-loaded’ media streaming devices. They wanted to raise awareness of the legal, moral, social and online security issues, educate people who don’t know they’re breaking the law, stop vulnerable people becoming ‘pirates’, and encourage people to call in with information on anyone offering illegal streaming services. It was important to squeeze every drop out of this campaign. We started by defining which messages, channels and visuals would convert most efficiently for minimum spend. This meant going in with a thoroughly tested tactical plan for messaging, visuals and channels, optimised for the highest engagement with each audience at the most cost-effective rate. 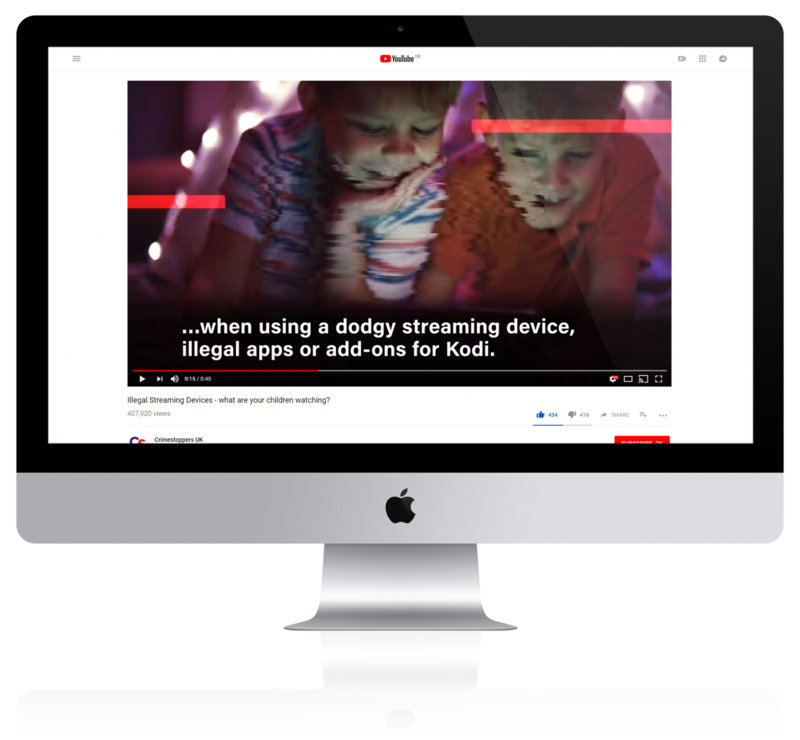 As part of the campaign, we created a suite of video assets with each video containing a key message – security risks, the law, organised crime, social responsibility or requests for more information. We used pay-per-click to target those actively searching for illegal content. We also used paid promotion on Google Display Network and YouTube, alongside paid social on Facebook and Twitter, to deliver targeted messages. The campaign ran for three months and was continually refined to achieve an incredible reach: 18.3m combined impressions and views, 1.4m video views, 65k website visits, and a 263% increase in contacts to Crimestoppers about illicit streaming devices – all for only £0.02 cost for each person we reached.